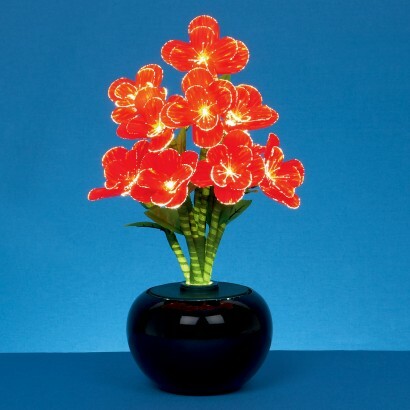 Fibre Optic Red Begonia Flowers combine the vibrant red flowers of the red begonia with the twinkle of colour changing fibre optics, creating a unique floral arrangement. The green and red of the artificial flowers and foliage will brighten the room with colour during the day, whilst the sparkling effect of fibre optics highlight the tips of each petal to add a hint of magical mood lighting in darkness, perfect for creating focal points and centrepieces. Bought for my severely Autistic grandson who is non verbal. He apparently loves it- as do his carers! Very nice effect, would recommend. This Begonia changing colour flower arrangement was SO POPULAR when I purchased it for a relative, everyone who saw it wanted one!!! I have put in an order for two more and expect delivery tomorrow. The first delivery was excellent, fast and on time. The goods were packaged very well and no damage to ornament. Hoping same for this delivery. The company keeps in touch by text and email which is good because you are able to arrange to be in to take delivery or for someone else to sign for you. Excellent product and very good service so far.